ROLPA, Feb 22: Bhumisara Gharti, a student from Rimsa village wakes up at five in the morning every day. Yet, because of the household chores, it is challenging to get ready for school by eight pm. Cooking, moping, washing and even taking care of cattle are some of the responsibilities she has to take care of. Sometimes the rush is so grueling that she doesn't find time for eating and leaves for school with an empty stomach. “I am always in rush. Many times, I go to school without even taking my meal,” Gharti said. “My life has always been like this,” she added. Getting to school also takes a lot of effort. She has to walk over two hours to reach there. “Life would have been lot easier for me if the school would have been nearby. If I walk very fast, it takes two hours. Else, more than that,” she lamented. Many girls and boys in the village, share this tedious daily routine. As they spend more than four hours a day in going and returning from school, they are left with little time and energy to complete homework or study at home. “Many a time, we are in so much rush that we even don't have time to comb our hair before leaving for school. We do it on the way to school,” Gharti said. “If we go with rough hair, teachers scold us,” she added. The issue is not just the long distance to school. Students from rural areas of the district often meet with an accident while going and returning from school. 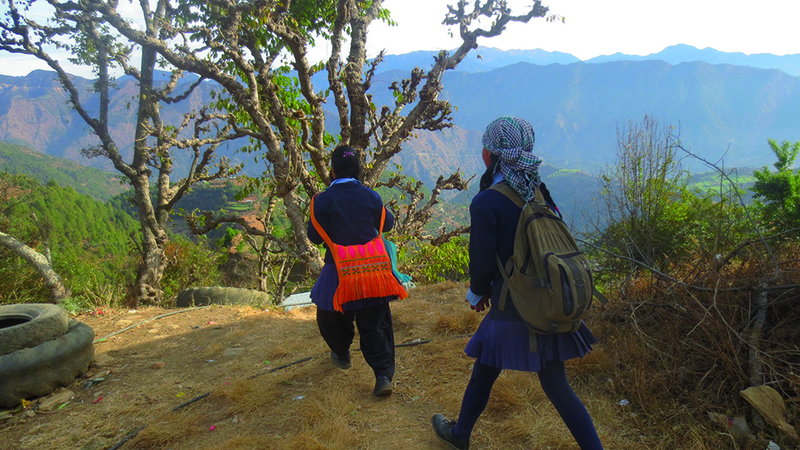 Gharti shared that the way to their school is very risky. “Though we use the same route every day, the hills are dangerous. Sometimes we fall while climbing and getting down those hills,” she said. “In towns, children can go to school in the bus even though schools are not so far. But here we have to walk for hours and that too on very precarious trails,” she added. Most of the time children reach home from school by 7 pm. Totally exhausted they are hardly left with any energy and time to study or work. Gharti urged for opening schools nearby. “We would be able to concentrate a little more on our studies if our school was nearby,” said the student of Nepal Secondary School. Rolpa is considered a remote district where most of the households have meager income. However, most of the parents here now aspire to give their children modern education. In lack of facilities, including schools, they doubt that their children will fulfill their dreams. Most of the parents lament the lack of schools in their own locality. They claim that their children are doubly affected. On one hand, they have no access to English medium schools and on the other hand, they have to make a long journey every day to reach school. “Even in this modern age, our children are getting old kind of education. They are not good in English,” said Badri Budha. “With the type of education they are receiving at school, how can we ensure a better future for them?” he questioned. “Since the schools are miles away, all their time is spent on the way. Where is the time to study at home?” he fumed. He further accused leaders of never fulfilling their promises of opening new road tracks, schools and colleges. There are 440 educational institutions in the district. Among these, 62 are secondary level schools. As per the data of the District Education Office, 86,523 children are of school going age and most of them have to walk very long to reach school. “Even though politicians make promises during elections they never deliver them. If they had fulfilled even some of those promises, our children would have been studying in nearby school and our life would have been far better,” said Budha. “Many of the senior leaders were born here but none of them have worked for their district's development,” he added.